When little girls fantasize about what they want to grow up to be, some might imagine becoming an astronaut or archeologist while others might want to become lawyers or doctors. Others still might want to own a business. Yet, in the end, many don’t follow through with those dreams, thus creating a cycle of women going into lower wage jobs that are considered more traditionally female. This session, representatives have heard many bills regarding the economic status of women and ways to bring women into higher wage, higher-impact careers, or jobs that are dubbed “traditionally male.” If you think of the movie “North Country,” that starred Charlize Theron and was based on the true story of sexual harassment at a mine on the Iron Range, a woman might not want to pursue that traditionally male profession. This is why House Speaker Paul Thissen (DFL-Mpls) recruited women’s organizations after the 2013 legislative session to research ways to improve the lives of working women and to create the Women’s Economic Security Act. Women make up more than 51 percent of the state’s workforce. Thissen said their well-being clearly has an impact on the state’s economy. With many families headed by women today, the welfare of their children is very much dependent on a woman’s economic status. And that’s where the room for growth is as well. More than 60 percent of low-wage workers are women who make the minimum wage or less. During last session, the Legislature decided to reappoint the Office on the Economic Status of Women, a nonpartisan legislative commission that examines just that, the economic status of women. The office sat empty starting in 2011. Barbara Battiste was appointed as the director in January. 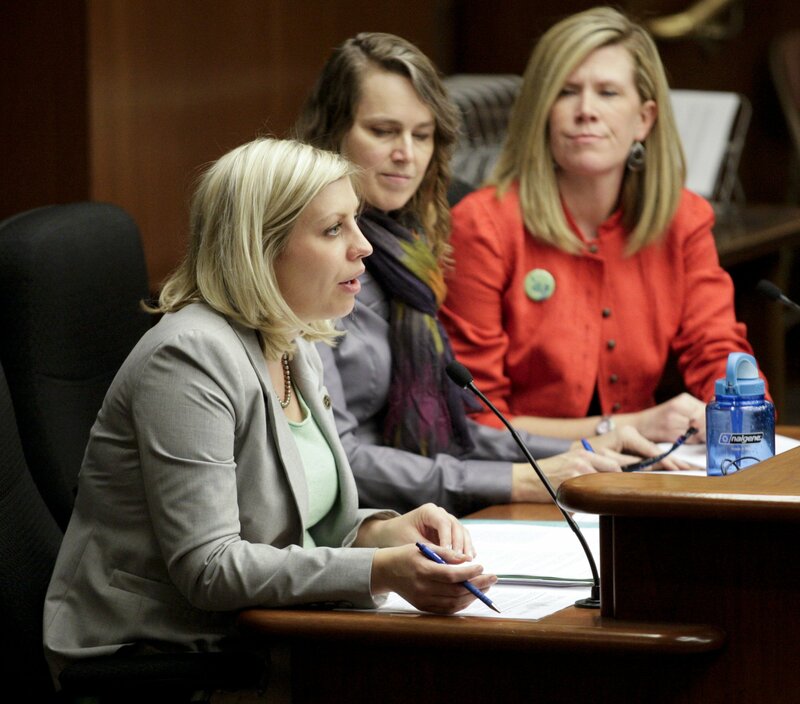 Left: Barbara Battiste, director of the Minnesota Office on the Economic Status of Women, testifies March 6 before the House Jobs and Economic Development Finance and Policy Committee HF2243. In Minnesota, women own one in four businesses and women in hourly wage jobs still make only 80 cents for every $1 men earn. Female entrepreneurs make 60 cents for every $1. Battiste said this is because women start businesses that don’t have high economic impact. For instance, a woman’s business could be a virtual assistant company, where she does everything an on-site assistant would do like scheduling appointments or helping with administrative work. This would be considered a part of the service industry. While it’s a worthwhile service, by comparison a man is more likely to create a technology startup that would be much more likely to generate high-impact income. The man might be creating the next “Angry Birds,” while the woman is booking a plane ticket for someone else. Research done by the University of Minnesota Humphrey School’s Center on Women and Public Policy and the Women’s Foundation of Minnesota found that the state continues to be a national leader in women’s workforce participation, with women earning a majority of all college degrees. However, this fact has still not translated into economic equality. In the 2011-2012 school year, construction programs saw just 3 percent of program graduates that were women. The reason? “Women lack an awareness of these jobs and lack the preparatory skills to be accepted into apprenticeship programs,” Fitzpatrick said. And this fact points to girls and boys being treated differently, a topic that rubbed one representative the wrong way. Though the world is changing and more women are holding executive positions within companies, Kieffer said it’s sometimes more about instinct and that women and girls move more naturally to verbal professions and the arts. allowing employers to voluntarily disclose wages. The bill awaits action by the House Ways and Means Committee. The companion, SF2050, sponsored by Senate President Sandy Pappas (DFL-St. Paul), awaits action by the Senate Finance Committee.